The original architects of rock 'n' roll were black musicians including Little Richard, Etta James, and Chuck Berry. Jimi Hendrix electrified rock with his explosive guitar in the late 1960s. Yet by the 1980s, rock music produced by African Americans no longer seemed to be "authentically black." Particularly within the music industry, the prevailing view was that no one--not black audiences, not white audiences, and not black musicians--had an interest in black rock. In 1985 New York-based black musicians and writers formed the Black Rock Coalition (brc) to challenge that notion and create outlets for black rock music. A second branch of the coalition started in Los Angeles in 1989. Under the auspices of the brc, musicians organized performances and produced recordings and radio and television shows featuring black rock. The first book to focus on the brc, Right to Rock is, like the coalition itself, about the connections between race and music, identity and authenticity, art and politics, and power and change. Maureen Mahon observed and participated in brc activities in New York and Los Angeles, and she conducted interviews with more than two dozen brc members. 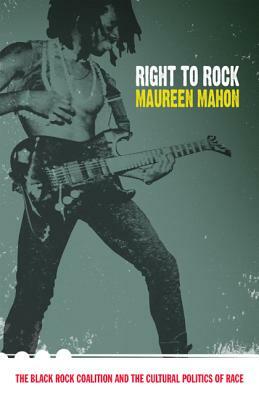 In Right to Rock she offers an in-depth account of how, for nearly twenty years, members of the brc have broadened understandings of black identity and black culture through rock music.